Mantis shrimp are common in most oceans of the world. They are active predators and tend to prowl shallow reefs and shorelines in daytime. Their vision is excellent, and they are reputed to be intelligent and curious; in an aquarium, these creatures are said to be capable of interacting with their keeper. I have briefly spied what I took to be mantis shrimp before — inch-long critters that mostly blended into Caribbean reefs. They were small, poorly seen, and too fast for me to photograph. I had read about the more glorious, colorful and larger variants to be found in the Western Pacific so my hopes were high when we arrived at the Lembeh Resort. I was not disappointed. 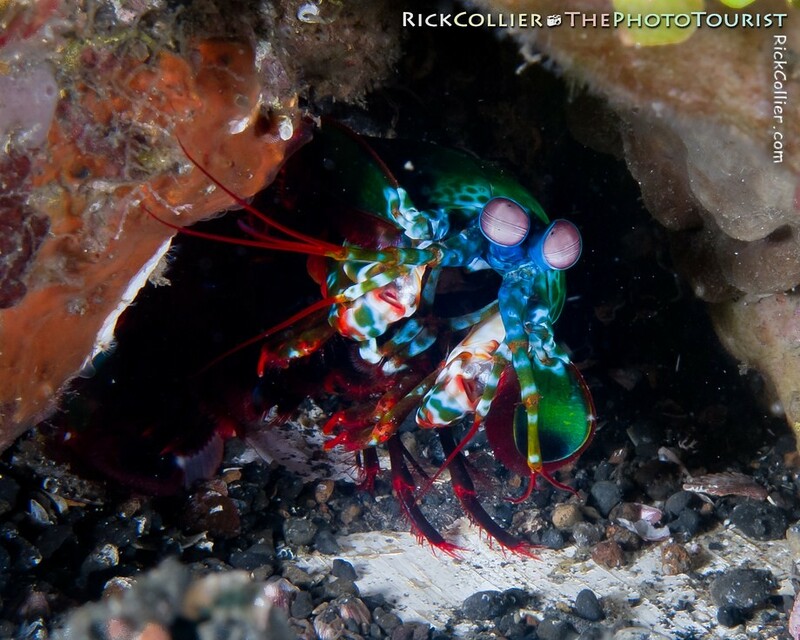 There are several types of mantis shrimp in the Lembeh Strait, and most are easy to see and not easily intimidated by divers. We saw many, ranging from small, brown or reddish specimens to the giants that may grow as large as a foot (30 cm) or more. On one dive, we even came across two fighting in the sand. None we saw was more striking than the beautifully colored “peacock” or “harlequin” mantis shrimp. 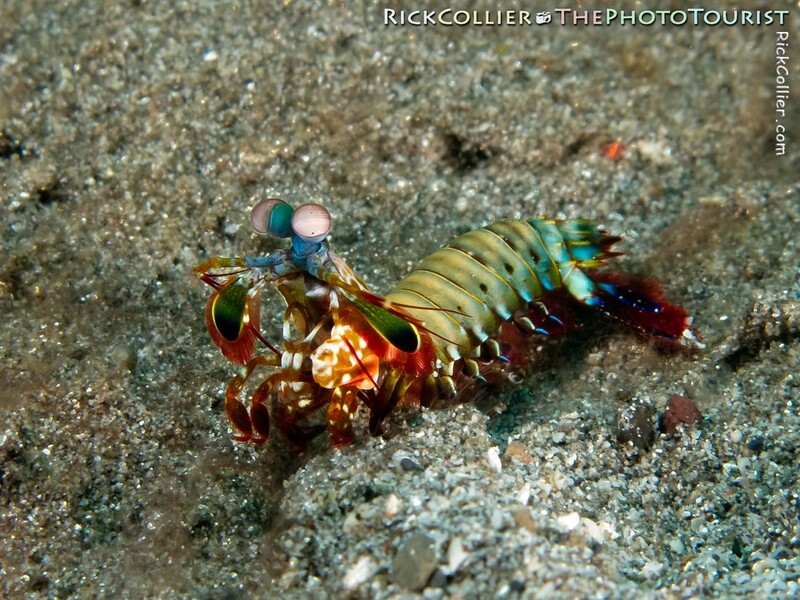 We saw peacock mantis shrimp that were beautifully colored in brilliant hues. They also seemed just a bit curious. The one above actually came a little out of its hole to spy on me. Encountered out on the sand, the little beasties would turn and even come slightly towards a diver — seemingly to get a better look with its large, colorful, articulated eyes. Moving gently, I had little trouble approaching for a photo. (Still, caution was in order: Also known as “thumb splitters,” this little predator’s strike can break a camera housing or spear a finger to the bone. This entry was posted on Tuesday, February 15th, 2011 at 15:39 pm. It is filed under thePhotoTourist and tagged with bottom, burrow, crustacean, dive, diving, eye, eye stalks, eyes, harlequin, harlequin mantis shrimp, Indonesia, Lembeh, Lembeh Strait, mantis, mantis shrimp, North Sulawesi, peacock, peacock mantis shrimp, photo, Photo Tourist, PhotoTourist, sand, sandy bottom, scuba, shrimp, stomatopod, stomatopods, Sulawesi, the Photo Tourist, thePhotoTourist, tourism, tourist, u/w, Underwater. You can follow any responses to this entry through the RSS 2.0 feed.